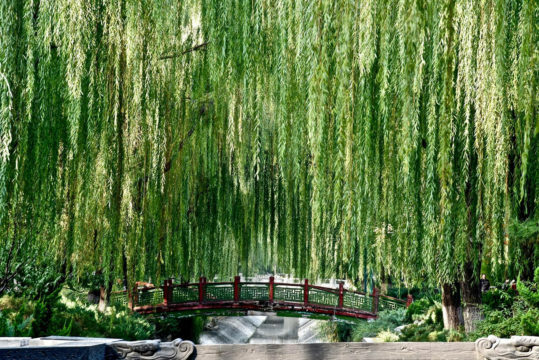 Here are a dozen of Ellen’s photos from our recent trip to China. If you want to see more, there’s a slide show too, which I highly recommend. Details below. If you want to see more photos, click on this China Travel slide show link. Then, for the best viewing, click on the tiny, tiny arrow in the very small rectangular box at the top right of the opening page of the link to start the slide show. See all the photos in the largest size possible format (i.e., use a laptop or desktop computer if you have access to either). So what made the trip wonderful, successful, unique, and superb? First, a bit of background. About 35 years ago we hosted a Chinese student for five days who had just completed her Masters degree at Stanford. She returned to China and worked for the English language newspaper, China Daily. She met a writer from People’s Daily, the main Chinese newspaper, and after they were married, her husband, Jiang, came to Washington as a Visiting Scholar at Johns Hopkins School of International Studies. He lived with us for several months before returning to Beijing. We all kept in touch, and we visited Xiaoli, Jiang, their parents, and their young son several times on other trips to China. When our daughter Annie (who was four when Xiaoli first stayed with us) married, we were very touched that Xiaoli came from China for the wedding. In 2016, Xiaoli and Jiang returned to the US when their son Kun graduated from a Masters’ program at MIT. They visited us in DC, along with Kun and his girlfriend Xi, and asked us when were returning to China. We said if they planned a trip that included a few places they have always wanted to visit in their country and some places to which they wanted to return, we’d come in 2017. While Xioali and Jiang were planning this trip, Kun and Xi decided to get married in DC. As their parents could not make the trip for the wedding, Ellen and I stood in as ‘parents’ for Xiaoli and Jiang. What a delightful ‘responsibility’ that was. That, then, is the background, and also the first answer to what made this trip so special: being able to spend 15 days with Xiaoli and Jiang – friends we had now known for almost 35 years – in their country, and under their ‘supervision.’ Although they are merely ten years younger than we, they treated us a bit like they treat their elderly parents. Ah, there is much to be said for filial piety. We never lacked for conversation nor tired of each other, and when we parted on our final evening back in Beijing, it was with both delight and sadness, along with the beginning of some plans for a future trip to China. One or two words that describes the four of us together? The second answer to what made the trip so successful has to do with the wonderful planning that preceded our arrival in China. The plans that Xiaoli made, with assistance from Jiang, couldn’t have been better. 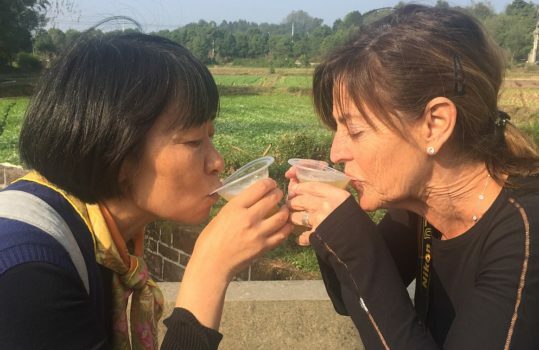 Since Ellen and I had been to most of the usual places visitors go in China, Xiaoli focused on areas of her country that most foreigners have not visited, which also happened to be places that she and Jiang wanted to visit or revisit. If, as it is often said, the devil is in the details, so too is success in the details, especially for a 15 day trip for four people covering more than 5,000 miles, four flights, parts of five days in a car, a half day on a boat, one six hour a half hour high-speed train ride, hotel reservations, and feeding four people who have high expectations for what they eat (and who have varying tastes). The planning was flawless. And when, just shortly before the trip was to begin, an earthquake closed one of the planned highlights of the trip, Jiuzhaigou Natural Reserve, Xiaoli simply substituted another scenic wonder we took to calling “the mini-Jiuzhaigou. It turned out to be one of our favorite experiences. And that brings us to the third answer to the question, the itinerary, the heart of the trip, where we went and what we saw and did. 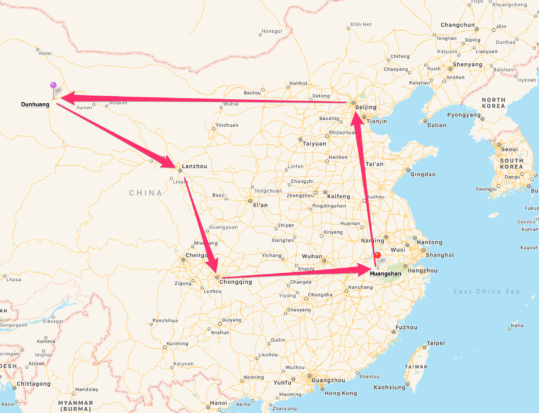 As you can see (especially if you enlarge the map at the top of this post), there were five major cities we visited and used as bases for explorations: Beijing, Dunhuang, Lanzhou, Chongqing, and Huangshan. On our arrival in Beijing (population 21 million), we stayed overnight with Xiaoli’s parents, now 88, and spent a lovely afternoon and evening with them. 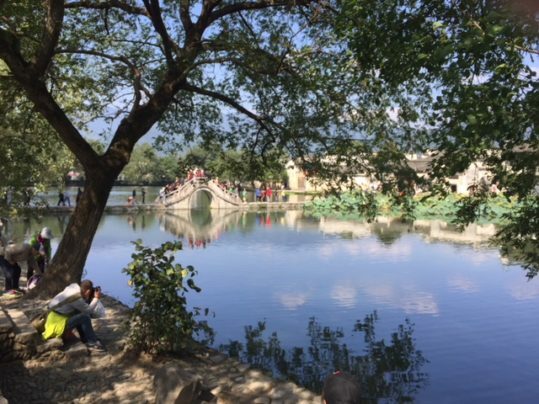 We were also able to spend a few hours just leisurely wandering in the delightful Suzhou style garden (Xie Qu Yuan) at the Summer Palace. At the end of our trip, we returned to Beijing for 24 hours and some familiar sites. Plus, we ended our eating adventures with two Peking Duck meals. 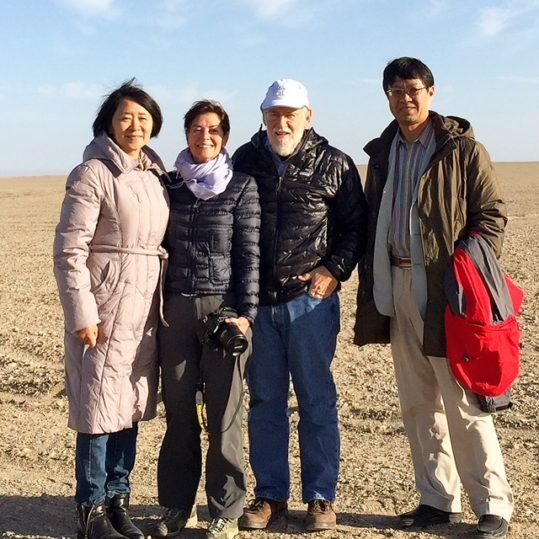 We flew first to Dunhuang (population 187,578 in 2000), crossing over deserts and mountain ranges to this former Silk Road crossroads, 1400 miles to the west of Beijing and near the borders of Inner Mongolia and the Xinjiang Autonomous Region. 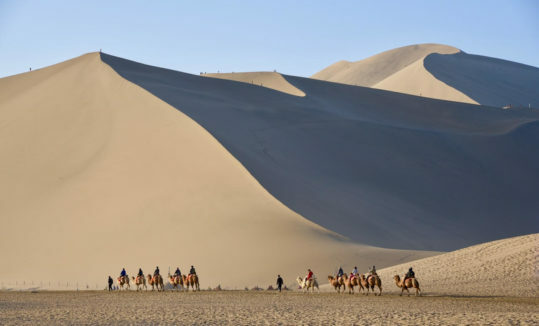 Located in Ganzu province — one of China’s poorest — we went to Dunhuang to see the Mogao Grottoes, the Gobi Dessert, and the Ming Sha Shan (Singing Sand Dunes). What a superb start to the trip. The 1500 year old Mogao Grottoes house thousands of Buddhist sculptures, wall paintings, drawings, art works, and manuscripts throughout the 750 caves and have been described as “the largest, most richly endowed, and longest used treasure house of Buddhist art in the world.” It was fantastic to see. 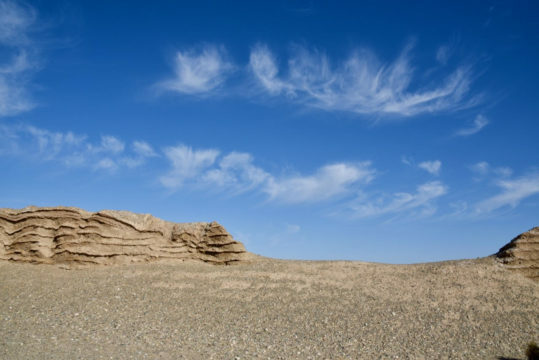 We spent part of a day driving to and walking on the Gobi Dessert where we saw ancient remains of the end of the Great Wall of China, a very different sight from what you see of the Great Wall near Beijing. The highlight of this first stop on our explorations was the Ming Sha San (Singing Sand Dunes) and Crescent Lake. One afternoon we took a jeep ride to the top of one of the highest dunes (Jiang led the way on a motor bike) and spent almost two hours awaiting the sunset and trying to absorb what for all of us was unlike anything any of us had experienced elsewhere and certainly one of the most memorable scenic vistas of the trip. Early the next morning we returned to the Sand Dunes and walked leisurely to Crescent Lake, another not to be forgotten landscape. We then flew an hour and a half southeast to Lanzhou (population 3.6 million) which served as our base for further explorations in rural Ganzu Province. We spent two nights in smaller towns (Die Bu, pop. 52,166 and Dang Chang, pop. 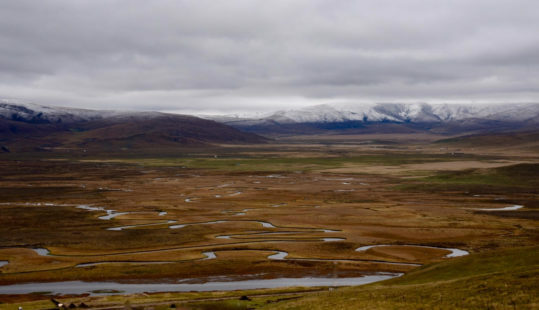 310,000), driving 12 hours over three days through Muslim and Tibetan towns and villages, visiting Buddhist monasteries, and stopping at several landmarks from the Red Army’s Long March (Lazikou). But we decided to move on, as planned, to Guan E Gou which local people nicknamed the “mini Jiuzhaigou.” A lovely three hour stroll up a paved mountain path took us by more than 20 waterfalls and spectacular views around every bend. Time spent here made up for not being able to stay at the “Stone Box” or visit Jiuzhaigou Park, as once again we were mesmerized by the stunning beauty of a place we had never even known existed. 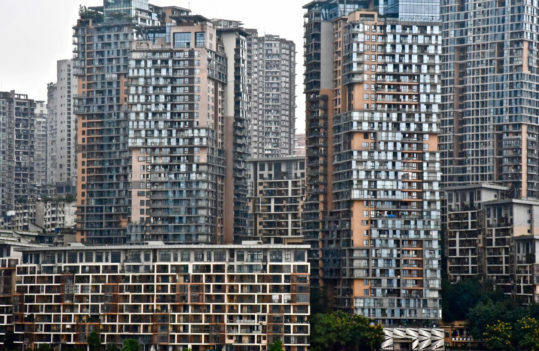 Then we flew south to Chongqing, formerly Chungking (population of four million in the central city itself but if you include the four connecting municipalities with the same name, the numbers rise to over 30 million) for a 28 hour visit with family of Xiaoli and Jiang’s daughter-in-law Xi. We were again stunned by what we saw. Auntie took us on a whirlwind tour that included historical sites, the largest/deepest escalator in Asia, redeveloped areas of the city, the 100,000 student university, a visit to her home, two unforgettable meals (more on food later in this post), and a lovely morning and early afternoon drive in the hills above the city. We were so entranced, and Auntie was so enthusiastic to show us her city, that we almost missed our next flight. Next was Huangshan (population 1.5 million), a 1,000 miles almost due east of Chonqqing. This Anhui Province city and the surrounding area was ‘home’ for three days and nights and had everything that draws us to travel: beautiful natural scenery, ancient and modern culture, local cuisine, and the opportunity to experience all of these treasures with the assistance of two residents of Huangshan, long time friends of Jiang’s. 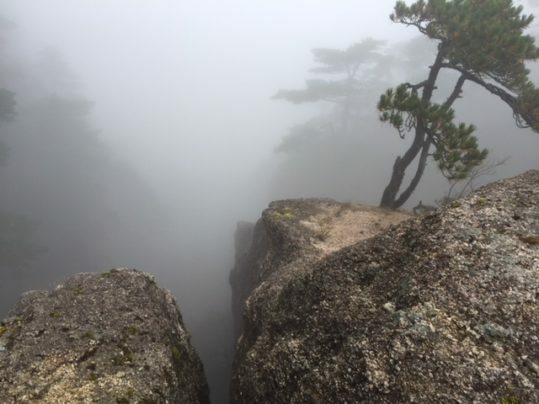 Our first day here was devoted to Yellow Mountain (Huangshan), another one of China’s premier scenic wonders (UNESCO World Heritage site) and the source of many Chinese landscape paintings and poets’ inspiration. We were joined by a friend of Jiang’s who took us on the cable car part way up the mountain and who had access to the highest point of the mountain, Lotus Peak, even though it was closed for regeneration. 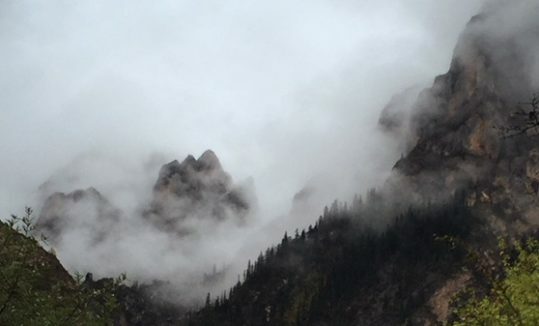 Most of the mountain was covered in fog and mist for our entire time there, but there were enough bursts of clearing that we were able to begin to understand why this is such a special place with it’s jagged rocks, unusual pines, and ever present mist, fog, and clouds. Our climb was difficult, but as we had the place to ourselves, we were able to walk (and some times crawl) slowly and to allow the mountain to reveal itself to us. 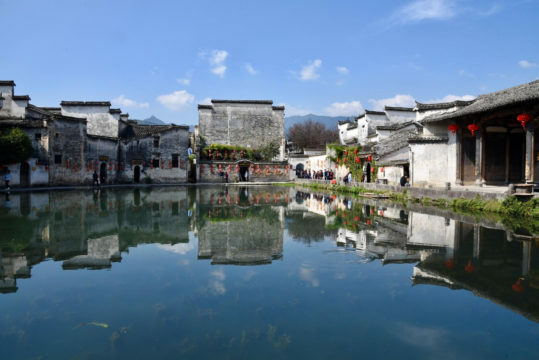 We spent part of another day exploring the rural Anhui countryside with its white peaked houses, its rich agriculture, and its delightful rows of white chrysanthemum tea plants. We spent part of this day strolling through the ancient (15th century) village of Hongcun, another World Heritage site, and had a well-known calligrapher create a Miller family scroll, which now hangs in our DC home. An artist friend of Jiang’s introduced us to a ‘factory’ that made bars of ink for calligraphers, took us to his ink stone carving studio to proudly show us his work, and directed us to another friend who demonstrated how calligraphy brushes are made (and had us make some ourselves). We ended this day first around a large table in a local restaurant with Jiang’s two friends, their families, and the four of us with many toasts and expressions of appreciation for each other. Then we went to the apartment of Jiang’s artist friend, had carefully made tea and the opportunity to see his own handiwork and his collection of ink stones, pottery, and art/sculptures. On our third day we spent three hours on a boat on the Xin An River, because no trip is complete without seeing the country from one of its rivers. I could have stayed on the boat for the entire day to soak in the beauty of the Anhui countryside. But there was more to see and do and not enough time for everything. We strolled all too briefly in the ancient Huizhou City and visited the Tangue Memorial Archways, seven Ming and Qing Dynasty monuments commemorating individuals for their “loyalty, filial piety, moral courage and righteousness.” Then we ended that afternoon with an all too short time wandering through the Baojia Garden where bonsai art and stone edifices are integrated into a Suzhou type setting that I found simply stunning and unforgettable. We returned to the old part of the town for a bit of shopping — an ink stone, pottery, some gifts for our children and our children’s children, and some dried bamboo (to be consumed at our annual Chinese Thanksgiving celebration back in Washington). The four of us had our final local meal on the second floor of a restaurant overlooking the crowds wandering in this warren of streets and shops of Huangshan, a lovely, lovely end to these three days and to our explorations of another part of this China that was new to us, despite our three previous trips to this country. What was the most memorable site for you? 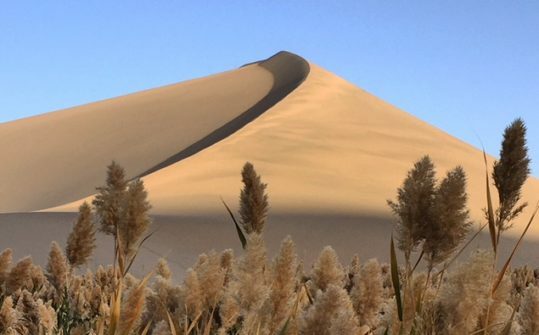 Xiaoli – Sand Dunes and Dunhuang as a whole. 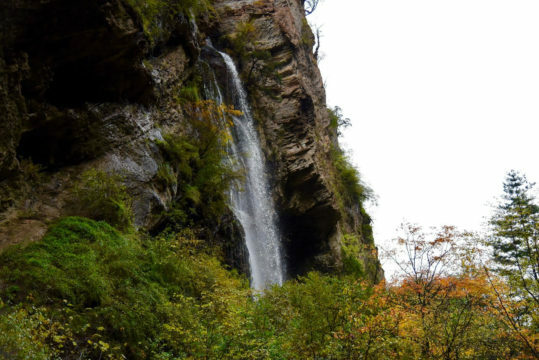 Jiang – The waterfalls of Guan E Gou. Ellen – The “Stone Box” and its Tibetan village. What was the best day for you? Xiaoli – The second day in Huangshan – wandering through the ancient village of Honcun, meeting Jiang’s artist friend, learning about the making of ink, ink stones, calligraphy brushes, and then dinner with everyone that evening..
Jiang – Hard to answer, but I’d choose the first afternoon in Dunhuang at the Mogao Grottoes. 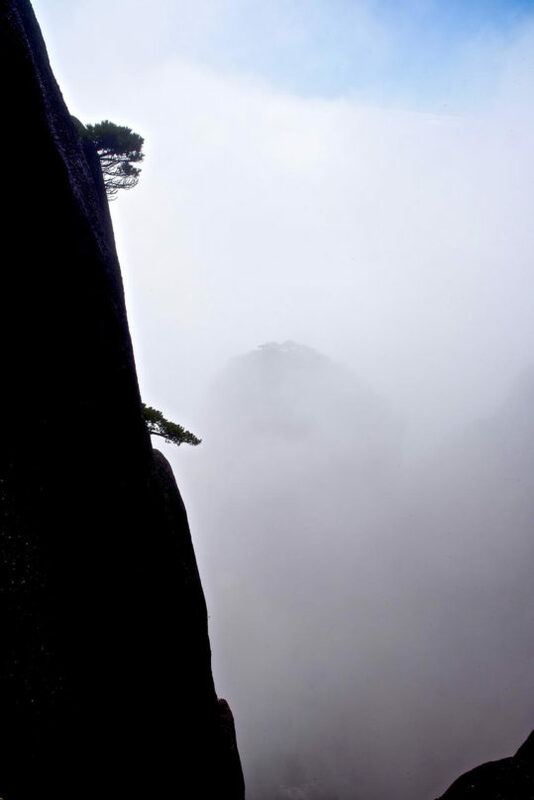 Ellen – Climbing to Lotus Peak on Huangshan Mountain. Richard – “Stone Box” day. Xiaoli – Guan E Gou waterfalls, Sand Dunes, Huangshan Mountain. Jiang – Guan E Gou waterfalls, Bhudda Light on Huangshan Mountain, Sand Dunes. 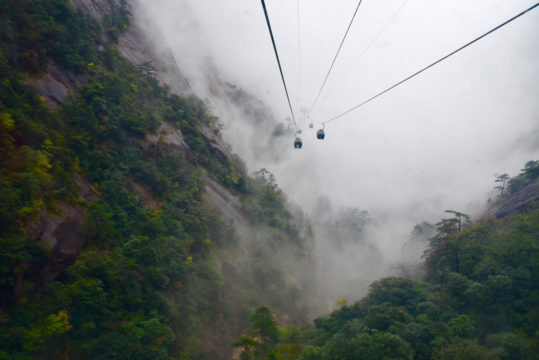 Ellen – Huangshan Mountain, Sand Dunes, Guan E Gou waterfalls. Richard – Sand Dunes, “Stone Box,” Baojia Garden. What was the role each of us played (the job taken or ‘assigned’)? Xiaoli – Chief Planner, Travel Agent. Jiang – Time/Plan Keeper and Food Guide. Certainly for a trip to be in the highly successful category, there has to be good food, especially for this group of four. I’ll spare you a day by day accounting, but largely we focused on local specialties throughout the 15 days. Breakfasts were primarily in the hotels (excellent accommodations throughout) and consisted of lavish buffets with many tempting offerings from both the east and the west. After the first couple of days, I avoided these enticements, except for an occasional yogurt or bit of fruit and coffee. Ellen did a bit more, and Jiang and Xiaoli fully participated. 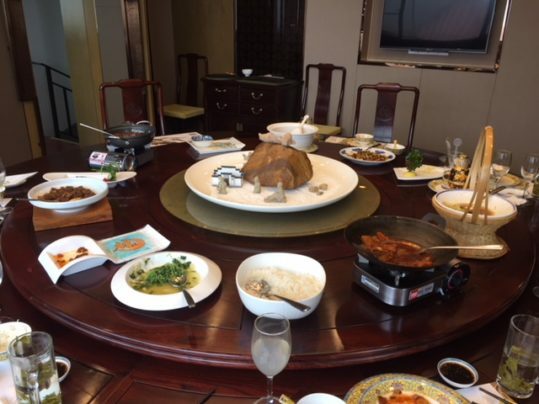 For lunches and dinners, Jiang led the way, searching out the best local cuisine in each region we visited. We ate in places with as few as three or four tables and restaurants filled with festive groups of dinners who checked out what others had ordered and asked for similar dishes. We ate grilled lamb (not so good) in the night market of Dunhuang and in a particularly lively, family run restaurant in the same city (excellent). The beef noodle soups in the western provinces were both simple preparations and universally delicious, inexpensive, and were often our ‘go to meals’ for lunch. There were two hot pot meals that were memorable. One was in the small town of Dang Chang where the four of us had a lovely evening as we learned about Jiang’s experiences in Inner Mongolia from the age of 16-22 while we kept adding to and subtracting from the mild but favorable hot pot in the middle of the table. 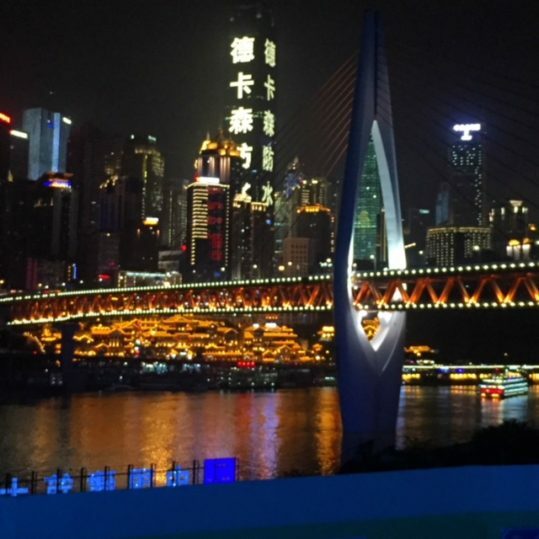 The second was with the family in Chongqing at a lovely outdoor setting overlooking the city. There one had a choice of using the inner hot pot (not spicy) or the outer one (beyond spicy) with platter after platter of seafood, various animal parts, and an occasional vegetable. In another Chongqing restaurant, we were served huge platters that consisted largely of red peppers, one dish reportedly had bits of frog, another of chicken, and a third of eel. I loved this restaurant. Ellen loved the setting but seemed to have trouble finding the food hidden among the peppers. Perhaps our most lavish meal was in a private dining room in a hotel on Yellow Mountain. I had no idea what most of the dishes were, but Jiang and Xiaoli assured us the meal was not just unusual but also delicious. And the group meal mentioned in the Huangshan section above was enjoyable, both for the food and the company. 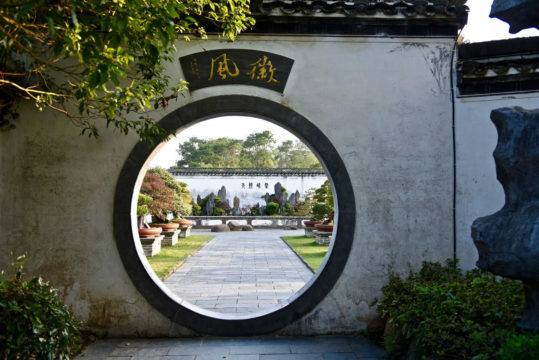 There were vegetables everywhere we went, many that were new to us (dried bamboo, for example) and Jiang was particularly enthused to find a mushroom that grows on a stone, a local delicacy in Anhui Province. Amongst other adventuresome ‘delights,’ we had “smelly” tofu and “stinky” fish (and both lived up to their names), stone frog and fungus soup, mushrooms unlike any we had ever eaten (or seen) and body parts of animals that were likewise not common dishes for us. Mostly, our lunches and dinners were simply and freshly prepared and were largely unrecognizable compared to Chinese restaurants in the US. We enjoyed all the food (though Ellen claimed that the first thing she wanted to eat when she returned home was “Nothing.” I think Xiaoli and Jiang were pleasantly surprised at how well Ellen and I used chop sticks, my dexterity in eating fish with small bones, and my ability to enjoy spicy food. Additionally, they were pleased with how much good food was available (at quite reasonable prices) throughout our trip. So there you have it. Lots of reasons for why we used the words “Wonderful,” “Successful,” “Unique,” and “Superb” to describe a trip that will long stay with each of us. And the best is yet to come. China Thru Ellen’s Lens, photos that will be posted within the next few days.